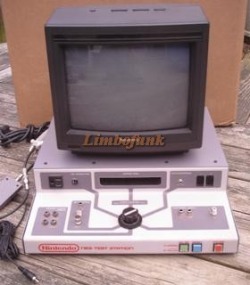 Other than the Nintendo Test Cartridges, this item is probably the most popular piece of test equipment and is also the most expensive to acquire. This station was set up and meant to be used to apply a quick test on accessories or the system to check and see if they were working properly or not. Items that could be tested include: The NES , audio/video cords, RF adapters, AC adaptors, game paks, controllers, Zappers, Power Pads, NES four score, NES sattelite and ROB. The black knob in the center of the panel switches between the various testing operations and a simple pass/fail detection method for each item is used. Though it is very easy to use, repair centers were given instruction guides detailing how to properly test each item and what to look for. As a side note, an add on unit for the Super Nintendo was manufactured and made to be attached to the left hand side of the Test Station base.